On the 1st of November 1996, I wrote and uploaded the first ever catfish of the month article. Precisely twelve years and 144 catfish of the months later it’s the 1st of November 2008. In my personal life, this is also the birth date of my first child - twelve years to the day after the first catfish of the month, I enter a new phase in my life. It’s now the 15th of November and I am only now getting to write the article for this month. I hope with such an introduction you will understand why the article is late this month, but I wouldn't worry too much for the future of the site, I've learned a thing or two about making good use of time over the years. With it being such a momentous month, it’s harder than usual (and with 144 species covered, it does not get easier each month) to select a species to introduce on this most auspicious of months. I also tend to write from experience, pooling knowledge and sharing my observations. So, in honour of all the things I don’t yet know about being a father, I've decided to feature a catfish that I have long been interested in keeping but have as yet not kept. It is however a favourite fish to all those catfish keepers I know that have kept it over their fishkeeping years, but they are, surprisingly, a select few in number. In the aquarium catfish olympics, the mochokids, or squeaker cats, may only take the bronze medal postion in the “family most kept” event. After the multitude of silver corys and gold plecos found in our aquaria, the next most varied group of catfish kept are from this African family of catfish. The aforementioned first ever catfish of the month was also a mochokid, so my choice was this month was made. 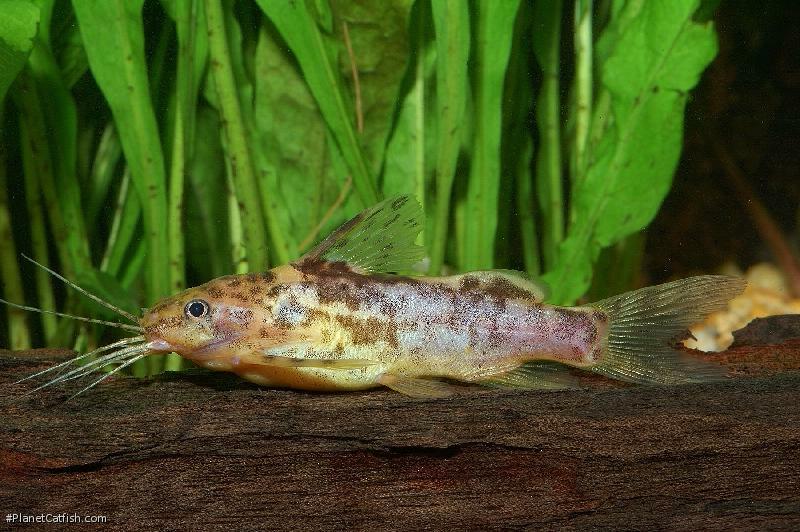 Discovered in the rainforest of Sierra Leone, Payne’s Catfish is a charmer, albeit one of the most uncommonly encountered of species. I've seen them for sale this year, but that encounter was the most recent of only a handful over the last couple of decades. Talking about time, members of this site have kept specimens for more than a decade and a half, so it’s a hardy little catfish too. I say little with some justification, because their generic name is Mochokiella, which means little Mochokus. Actually, this species is something of a halfway house between the larger Synodontis and the smaller Microsynodontis species. The genus Mochokiella is also monotypic which means that there is only one species that belongs to this genus. That’s interesting in itself, but it also means this species is reasonably easy to identify. It’s a slightly romantic notion, but to me the name when spoken, just sounds African and really evokes the lovely rhythmic sound of a typically African brogue. Aside from being smaller than most, it differs from Synodontis species having long branched barbels (usually the outer mandibular has 3 branches and the inner 4). To my eyes, these feathered barbels are a nice feature and compliments the species' attractive, if unremarkable, blotchy network pattern in dark bronze markings on a creamy yellowish to beige background. That makes our featured species also similar in appearance to some representatives of the genus Microsynodontis, but as mentioned before they have longer mandibular barbels, and also a larger eye, typically a smaller adipose fin (with white margin) and a forked caudal fin; Microsynodontis on the other hand have a rounded caudal fin and smaller eyes. It appears that the species is relatively sociable and because of its adult size it should certainly be consider that purchasing a group is the way to go. There are a raft of interesting riverine African charcins and barbs that would fit into an attractive biotope set-up. They could also be kept with other smaller, demure riverine Synodontis species such as S. contractus especially as Mochokiella appear to be less interested in hanging out on branches and sturdier leaves and lend themselves more to refuge found at ground level. Given such hiding places, the species will make appearances during the day from time to time and certainly turns up when food is offered. While perhaps not quite as hardy as some of the near indestructible Synodontis species, this ones only real requirement is a well maintained aquarium. It is an unfussy eater and will do well on dry foods, a few catfish tablets a week are all that it really needs. All those years ago, when I first started talking about catfishes online, I'd have certainly said that if I were to find a group of these species, I would look at fitting out a tank for them. I find that I look forward to seeing them just as much now - if not a little more. Type Locality Kassawe Forest Reserve, Sierra Leone. Etymology Mochokiella: From the Latin diminutive suffix -ella; in reference to the small size of the fish (literally: "a small Mochokus"). Distribution Africa: known from the type locality, Kassawe Forest Reserve, Sierra Leone. (It would appear that the correct name, according to Wikipedia is Kasewe Forest Reserve).